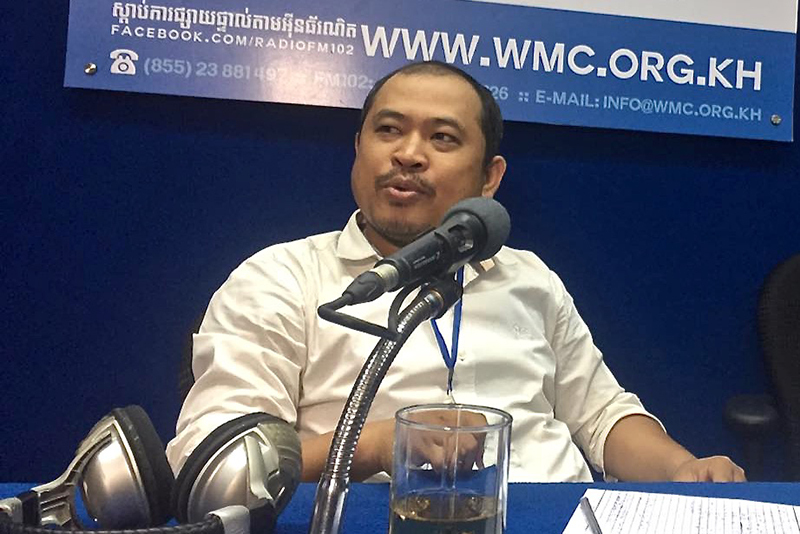 Political commentator Kim Sok appears for a radio program at the Women’s Media Center studio in Phnom Penh, in a photograph posted to his Facebook page. Political commentator Kim Sok’s worldly possessions—two iPhones, an iPad and $200 in savings—may soon become Prime Minister Hun Sen’s property after the premier filed a $500,000 lawsuit against the commentator for allegedly claiming that the CPP killed Kem Ley. Before the day was finished, prosecutors at the Phnom Penh Municipal Court had issued an order for Mr. Sok to appear for questioning on Friday and barred him from leaving the country. 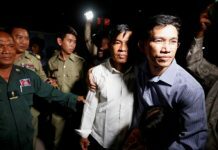 In an interview with Radio Free Asia on Sunday, Mr. Sok claimed that the CPP had man­ipulated the opposition party and said later that “they” killed Kem Ley, a political analyst murdered last July shortly after speaking out against Mr. Hun Sen’s family’s vast business holdings. Mr. Sok claims he never specified who he meant by “they,” but the premier was unswayed, with his lawyer demanding 2 billion riel, or about $500,000, for a claim they deemed slanderous. The reference appeared directed at Sam Rainsy Party lawmaker Thak Lany, who was convicted in November in absentia for making a similar claim. The exiled Mr. Rainsy, who resigned as president of the CNRP on Saturday, has doubled down on allegations of government involvement in Kem Ley’s death in the face of an ongoing court case. The prime minister said such accusations amounted to incitement and promised to “prepare the coffin” for would-be revolutionaries. Speaking in front of the municipal court in the morning, Mr. Hun Sen’s lawyer Ky Tech said Mr. Sok’s speech “seriously affected the CPP, and especially impacted the purity of the CPP” given that the party had condemned the killing. “I think that we have 100 percent of our records and activity in the video clip,” he said, adding that it was up to prosecutors to review the evidence and press charges. Mr. Hun Sen vowed no mercy in getting his money if he won the case. 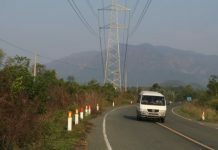 Mr. Sok laughed when told of Mr. Hun Sen’s plan to seize his property, saying the prime minister would have thin pickings. “The property I own includes one iPhone 6; an iPhone 7 Plus; one iPad; and clothes,” as well as $200 in the bank and no land or property, he said. Though Mr. Sok said he had once taught at several universities, the gigs had recently dried up, with the Cambodian University for Specialties declining to renew the outspoken critic’s contract last month. 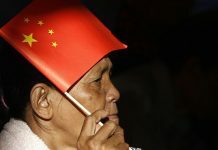 Mr. Sok, whose Facebook page says he earned an MBA in Beijing after studying mathematics at the Royal University of Phnom Penh, vowed to stay in Cambodia to contest the prime minister’s charges. Cham Bunthet, a political analyst and adviser to the Grassroots Democracy Party, said that Mr. Sok should not have been surprised his unfounded claims found their way to court.